On Sunday, July 28, there were never too many cooks in the kitchen for the 9th annual Great Chefs Dinner to benefit the Hayground School's Jeff's Kitchen and the Jeff Salaway Scholarship Fund. The cocktail and tasting party was held under a tent on the rural grounds of the Hayground School in Bridgehampton. A symphony of top chefs from Manhattan to the Hamptons rolled up their sleeves and cooked for a cause; signature hors d'oeuvres were made using the local bounty, while brewers, winemakers and specialty drink enthusiasts poured. The generosity from the community went beyond the taste of the tongue: a silent auction featured works by renowned local artists and other food-related prizes such as a Dock-to-Dish family membership package and a set of Wüsthof knives. The human spirit soared for the love of Jeff Salaway and his vision for the Hayground School's most innovative feature; Jeff's Kitchen, a state-of-the-art professional kitchen and classroom supported by a science lab, two gardens, a slow food Farmtek greenhouse and hen-house. Jeff's legacy has left an impact on the East End community and attracts celebrity guests including; Alec and Hilaria Baldwin and superstar chefs, Tom Colicchio and honoree Eric Ripert; their presence created a moment of pause from the feast. I and some other folks were fortunate enough to congratulate the honoree or even get a fan photo with the master chefs and the Baldwins'. Their time at the cocktail party was brief and they breezed through the tent to meet with their chef friends before heading over to the VIP dinner hosted by Toni Ross, honoring Four-Star chef Eric Ripert. The support of the East End community was outstanding; food frenzied fans were meeting the chefs and cheering on our local and regional food and beverage stewards for their contribution to the Hayground Schools biggest fundraiser. The school's unique culinary arts program focuses on sourcing food that is grown and harvested from its own gardens; it does not get more tactile than that. In the early 70's, the closest I got to an edible school garden were the dandelion weeds growing through the sidewalk cracks; little did my school know that these were edible. Eve in the Hayground School Garden. She is the daughter of Chef Arjun Achuthan, one of the founders of the Hayground School and director of the culinary arts program. Jeff’s Kitchen has been the model for many of the edible schoolyard projects on the East End. This farm-to-table routine is a daily classroom ritual; students from the ages of 5-13 spend mornings and afternoons planning, budgeting and serving lunch to the entire student and teacher body. Such a simple and powerful concept; students learn how to grow, prepare, and cook the bounty of the East End—there is no mystery around—"where did that vegetable come from?" "Our mission at Hayground is to provide an open, community school where conventional teaching methods are replaced by new ways of teaching and learning. We are committed to a program of innovation in a community of diversity, both economical and cultural." I daydreamed on what it would have been like to attend a school with this type of out-of-the-box curriculum, especially for someone like me who was taught by conventional teaching methods and fed tater tots for lunch; I struggled. But what is most encouraging are the children who attend this school, they will be shining examples of what it means to live a sustainable and bountiful life. Jeff's Kitchen and culinary arts program takes the mystery out of the meat, and brings children, chefs and the community together over a shared love of food; these children are the next generation who will carry the fork. Since the fundraisers inception, this event has raised over $1,000,000 for Jeff’s Kitchen and the Jeff Salaway Scholarship Fund. If you missed this event, be sure to buy your tickets next year as Jeff's KItchen and culinary arts curriculum is a great example for our community and nation at large. Look at it as an investment for your future and your children's future. Chef Bryan Futerman: There is so much to say about chef Futerman and his tremendous contribution as the educational coordinator for Slow Food East End; educating on the importance of edible schoolyard gardens. You can read all about him here. Now on to his whole roasted hog that was sourced locally. I tragically missed what the entire pig looked like as a whole, but I absolutely got to smell and taste this 6-hour, wood-fired roasted pig, porchetta-style with fresh lemon and rosemary. The pork sat atop a crostini that was drizzled with olive oil and the Hayground School kids made two sauces that was drizzled on top of the smoked pig: romesco and a kale pesto, all sourced from the schools garden. A sprinkle of rosemary flake salt, truly heightened the flavor of this "take me back to Italia dish", Bravo. Chef Arjun Achuthan: He is the co-founder of the Hayground School and the director of the culinary arts program. I met chef Achuthan at the Slow Food East End potluck dinner back in 2012 and was fascinated with their mobile pizza oven that I dream about having at Sheridan Green. The Hayground School kids helped with the making and plating of the pizza. Ingredients were locally sourced at: Mecox Bay Dairy for their sigit and fresh ricotta cheese that was made by Arthur Ludlow and Open Minded Organics, yellow and blue oyster mushrooms and black trumpet chanterelle mushrooms by David Falkowski. Chef Achuthan was a non-stop human machine, manning the pizza oven. The mushroom pizza and the tomato based pizza with eggplant and or squash were equally phenomenal. I would love to know how many pizzas were made that evening as the slices were flying off the table and the boy who served us was spectacular; his parents must be so proud. What a difference the weather makes as it was a perfect evening for this Savory Panna Cotta. Creamy, crunchy and refreshing all in one bite—well a few bites. I enjoyed the saltiness of the prosciutto that cut the creaminess of the panna cotta. The basil and heirloom tomatoes brought a summer brightness to the overall taste. Wölffer Estate Vineyard encompasses 55 acres and practices sustainable agriculture. Their wines are produced and bottled in Sagaponack, New York under winemaker and technical director Roman Roth. I tasted the Classic White 2011 and it was delightful; juicy, lush, fruity and crisp. What is so special about this dish? Feast with your eyes—it is so stunning! Reminds me of a beach summer sunset along the dunes of the South Fork. The depth of flavor unfolds a story of place; the East End of Long Island, fresh and bountiful. The vichyssoise is made from corn, local clam juice and potatoes from Bridgehampton. Then the soup is adorned with roasted lobster roe, basil oil from Pike Farm and micro-basil from Good Water Farms, Sensational. I love anything duck and this was incredible. On top of a thin crostini was the smoked duck loin that was perfectly cooked and the tomato and watermelon was placed on top. Great flavors from simple local ingredients; the tomato confit and the pickled watermelon had a unique flavor—would love to know how chef Carpenter prepared these—the tomatoes with the watermelon was a perfect combination; pungent, sweet and savory. The contrast between the smoked duck with the fruit was smart; the balance of ingredients was lovely. I loved their desserts as much as I admired this couples enthusiasm and spirit for all things: sweet, natural, healthy, organic, locally sourced, 100% gluten and soy free, all the time! And the best part is—you would never know these desserts were gluten free— visit their store in Bayport, NY and give it a try, I promise you will never know. 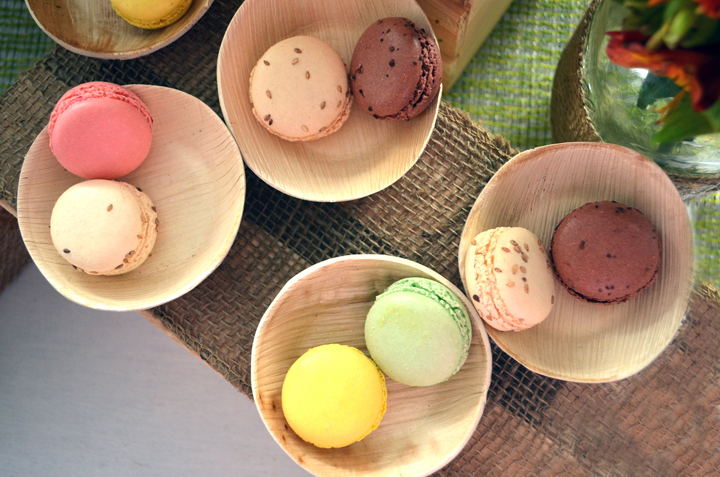 French Macaroons graced the table; the pistachio and lemon flavor was light and lots of punch, delectable. I could not peel myself away from the handmade mini-chocolate containers that held peanut butter whip and a drizzle of raspberry preserve; so elegant and light. Michelle and Christopher are getting married on August 10th and I have a hunch that their wedding cake is a peanut butter and jelly cake. For all of you lucky guests attending their wedding in Cutchogue, New York—forget about the chicken dance—you will be doing the peanut butter and jelly jig instead. It was a celebration at the Topping Rose House table with chef Kotz and staff. There was a genuine camaraderie amongst this team and it was just as bright and fresh as their amazing beet risotto. The beets were picked from the Topping Rose Farm that day; farm-to-table within seconds. This is a beet lovers dream and mine came true. A beat risotto, with roasted beets and shaved raw striped beets and to top it off my favorite local goat cheese from Catapano Dairy Farm; heaven. I am looking forward to visiting with the Topping Rose House and if I am lucky, maybe chef Kotz will show me how he made his beet risotto. This tea is a healthy non-alcoholic alternative to any meal and looks gorgeous in a wine glass. I found the Pure White tea to be light with a fresh and smooth velvety flavor. This tea is low in caffeine and a great antioxidant. Finally, a dinnerware that is environmentally friendly. The design is absolutely gorgeous and comes in a variety of shapes. The plates used for the Chefs Cocktail and Tasting party was VerTerra. The dinnerware is modern and allows the food to be the star. I love a product you can compost, however I would have a hard time throwing them out as they are so beautiful. This would be the product I would use for our —not yet announced Sheridan Green party. I am learning to enjoy oysters; slowly but surely I am getting there and chef Capon's bite may have done it. 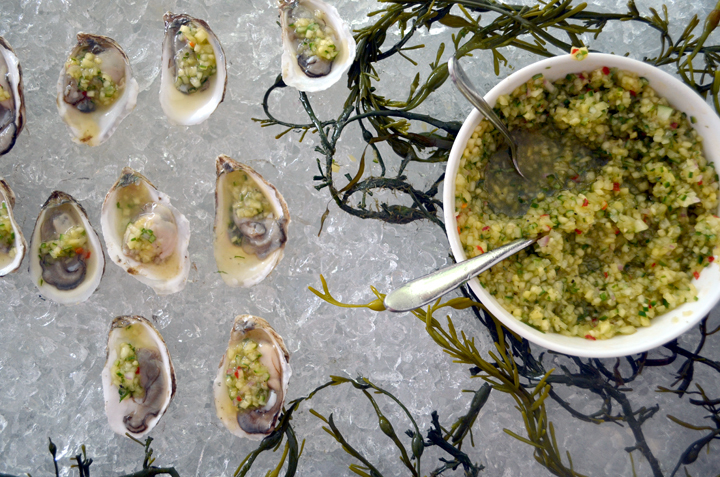 The oysters were fresh with a firm texture; a sweet aftertaste that sparkled with salinity.The oysters were topped with a jalapeño ponzu sauce and a pineapple relish that added a spicy kick. Keep on the look out for Lure Fish Bar at Miami's Loew's Hotel. I met Leeann last year at the Harvest East End; it was my first event and blog post for Out East Foodie. She is the author and true ambassador for the chefs and artisanal growers of the Hamptons and Long Island; stories about their connection to the land and sea and the growers who inspire them. Some local chefs that were at this event are featured in her homegrown book: chef Lia Fallon, the Riverhead Project, chef Bryan Futerman, Foody's, chef Jason Weiner, Almond and chef Realmuto, Nick & Toni's. Leeanne sold two cases of books and 10% of the proceeds went to the fundraiser pot for Jeff's Kitchen and the Jeff Salaway Scholarship Fund. Honoree Eric Ripert made a special stop at Leeann's table and stated, "He loves the book". That is a true testament from the Four-Star Chef; a book that you can only love, cherish and cook from. If you want a copy of this fabulous Hamptons & Long Island Homegrown Cookbook you can order it here or you can email Leeann Lavin at foodanddrinkny@gmail.com to get an autographed copy. I did not attend the VIP dinner, but you can see some of the images here.